Dip your hand in the cool and clear water of the Comal River as you float past lush cypress trees on an inner tube. Feel the rush of adrenaline as you soar through tight corners on a fast-paced waterslide. Don your cowboy hat and do some two-stepping at the oldest dance hall in Texas. These are among the many things to do in New Braunfels, a historic Hill Country town nestled between Austin and San Antonio. From outdoor activities like inner tubing and fishing to craft beer tasting and shopping, there are a seemingly infinite number of ways to spend a vacation in New Braunfels. Discover some of these things to do below. New Braunfels has not one, but two rivers that flow through town, giving you multiple spots to choose from for your summertime inner tubing and swimming. One of these is the spring-fed Comal River, a pristine body of water that originates in the Landa Park on the north side of town. The water stays at a refreshing 70 to 72 degrees year-round; the perfect temperature to cool off in the summer and it’s even warm enough for a winter swim.Tubing on the Comal River is one of the most popular things to do in New Braunfels, and there are several places you can go to rent one if you don’t have your own. Another option for aquatic adventure in New Braunfels is the Guadalupe River, one of the top recreational rivers in Texas, that flows from Kerr County to the Gulf Coast. The section that winds its way through the heart of New Braunfels provides a scenic backdrop for swimming and paddling. Yet one of the top ways to savor the natural beauty of the Guadalupe River is fishing. Get your bait and tackle box and try your luck at snagging a trout, bass, catfish, or sunfish, all of which are plentiful in the river. Fishing is such a popular thing to do in New Braunfels that there’s even a festival to celebrate it: Troutfest. 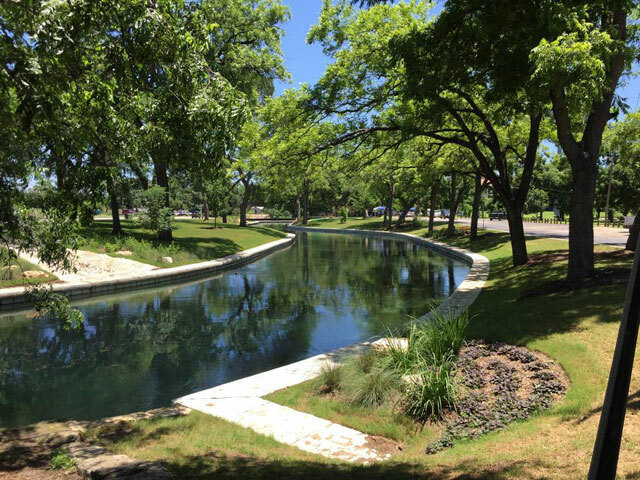 To access the Guadalupe River, visit either Cypress Bend Park or River Acres Park. Two spectacular rivers not enough for you? It’s a good thing New Braunfels is home to one of the top waterparks in Texas, then. 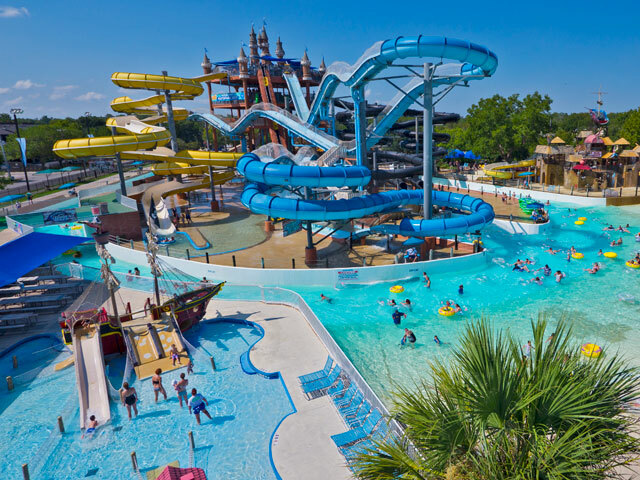 Thrilling water coasters and slides, relaxing wave and wading pools, and everything in between can be found at Schlitterbahn Waterpark & Resort in New Braunfels. Feel the rush of adrenaline as you plummet down the six-story-tall Master Blaster Uphill Water Coaster, or careen around the tight corners and over the rapids of The Falls, the world’s longest waterpark ride. Want to take it easy? Kick back and relax at The Beach Wave Pool or the Kristal Cove, a giant swimming pool with shaded seating and a gently-sloping beach. There’s plenty of fun for younger riders thanks to such attractions as the Lagoon Kids’ Area and Han’s Hideout. The dozens of rides, slides, and pools at Schlitterbahn serve up more fun than you can have in a day. Turn a day trip into a weekend of watery fun by booking a room at the Schlitterbahn Resort, located just steps away from the park’s rides. Swing your hips at the oldest continually operating dance hall in Texas, peruse European antiques, see an expert potter at work, or sip on a Texas wine or craft beer. 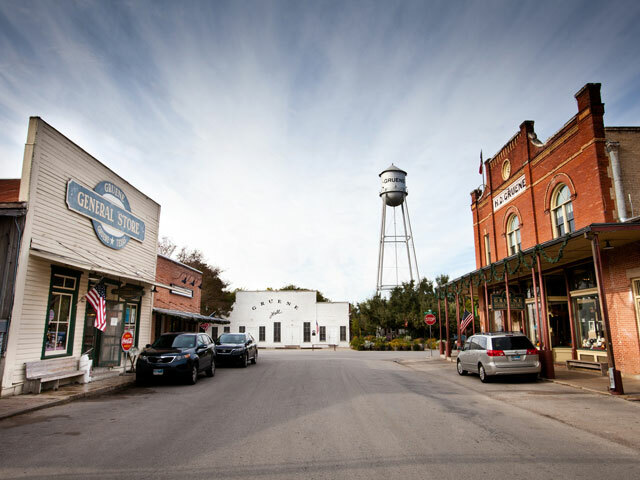 Do all of these things in the Gruene Historic District, a once-sleepy town nestled within New Braunfels’ city limits that is a destination in its own right. Originally settled in 1845 by Ernst Gruene, a German immigrant, the town is today a one-stop shop for everything Texan. The aforementioned dance hall, Gruene Hall, has been hosting big-name music stars and local performers since 1878. Honky tonk your heart out or peruse one of the many antique and home decor shops in the area, some of which reside within brick 19th-century storefronts. When your belly starts rumbling, find your way to one of the unique restaurants in Gruene, such as Adobe Verde, a Mexican restaurant located within a 1922 electric gin. With so much to see and do, no time in New Braunfels is complete without a visit to the Gruene Historic District. Descend into the depths of one of the top show caves in Texas when you visit Natural Bridge Caverns, a premier natural attraction about 25 minutes west of New Braunfels. Feel the cool air as you stroll past stunning stalactites and stalagmites and pools of clear water, all while being led by a knowledgeable guide. 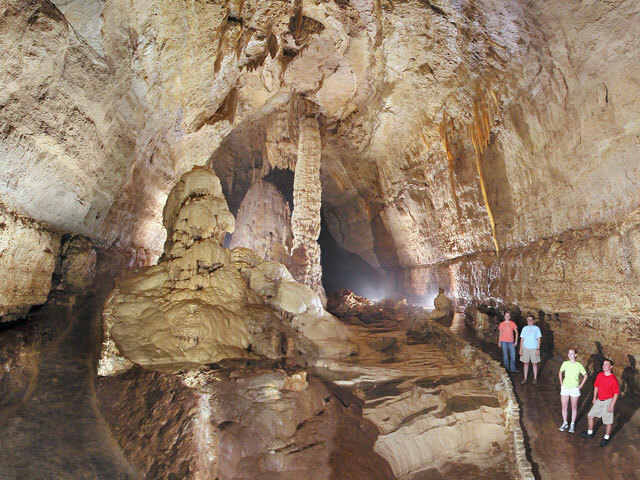 There are a variety of tours of Natural Bridge Caverns that you can choose from, ranging from short and sweet to longer and more adventurous. For instance, the Aquifer Tour is a 75-minute excursion on which you can observe the natural flow of groundwater within the cave. Meanwhile, the Adventure Tour is a physically demanding three- to four-hour tour that takes you to parts of the cave not seen on other tours. Along the way, you’ll hike, climb, rappel, and explore this stunning underground terrain; an experience not to be missed if you’re up for a challenge. The caves provide plenty to keep you busy, but there’s more to do above ground. Find your way through the AMAZEn’ Ranch Roundup, a challenging maze that has three tours and a bridge to climb in case you get lost. Go sky high at Canopy Explorer, a 60-foot-tall, four-tier adventure course with zip lines and platforms from where you can take in stunning views of the Texas Hill Country. If that wasn’t enough, you can mine for your own gems and fossils, or get a slice of pizza and a scoop of ice cream at the on-site Big Daddy’s Sweets, Treats and Brew. Whether you’re looking for an unforgettable underground adventure or some high-flying action, you’ll find it at Natural Bridge Caverns. Now that you’ve gone river tubing, ridden on a water coaster, and explored the depths of a spectacular cave, you might think you’re about done experiencing all New Braunfels has to offer. Think again. In fact, you’re just getting started. 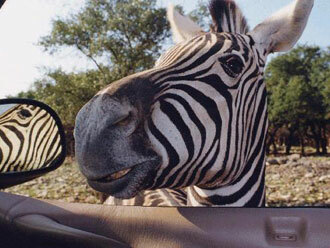 Take a walk on the wild side with a safari at Natural Bridge Wildlife Ranch (home to 500 exotic and endangered animals from around the world), or get an up-close view of primates, alligators, birds, and snakes at Animal World & Snake Farm Zoo. For a bit of New Braunfels town history, visit the Sophienburg Museum & Archives to learn about Prince Carl of Solms-Braunfels and the other people who played a key role in the town’s early days. Not enough for you? Discover the murals that make up the Historic Outdoor Art Museum, or take your youngsters to the McKenna Children’s Museum for a day full of discovery. Check out the full list of museums in New Braunfels to see what other experiences await you in this gorgeous Hill Country town. The Texas Hill Country is a hotbed for independent craft breweries, wineries, and vineyards, meaning it’s an equally great place to be if you’re into pale ales or Cabernet Sauvignons. Thanks to its three local craft breweries and wineries, New Braunfels is a great place to kick off your tasting tour through the region. In fact, New Braunfels is the gateway to the Hill Country Craft Beer Trail, a collection of 15 breweries within driving distance of town. 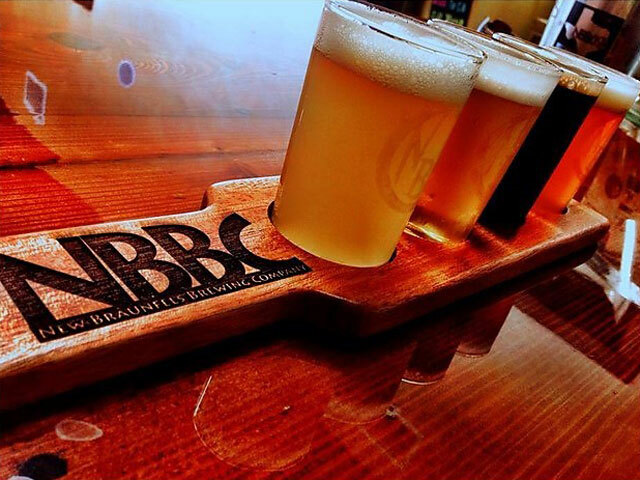 Start your craft brew tour at New Braunfels Brewing Company, a local outfit located in the heart of the downtown area that serves up unique brews made with fresh hops and local water. Meanwhile, the Faust Hotel and Brewing Company serves up German-style brews such as an altbier, along with a range of pale ales. Not only can you sample these beers in the tasting room, you can take a stainless steel growler with you when you go tubing down the river, or you can stumble upstairs to your room after a night’s worth of drinking. Finally, there’s the award-winning Guadalupe Brewing Company, where you’ll find out-there beers like a Pumpkin-style Texas Honey Ale or a chocolate stout flavored with coffee and maple syrup. If you prefer a glass of red wine to a hoppy pale ale, pay a visit to the tasting room at Dry Comal Creek Vineyards. This New Braunfels-based winery crafts a range of Texas-style wines, including a red made with black Spanish grapes native to the Lone Star State. Let the flavors of cinnamon, nutmeg, and dried fruit dance on your tongue as you relax in the tasting room, then get a behind-the-scenes look at the winemaking process on a guided tour. The Vineyard at Gruene serves up its own range of Texas wines, while The Grapevine in Gruene’s tasting room stocks an impressive range of wines from around the state and the world.